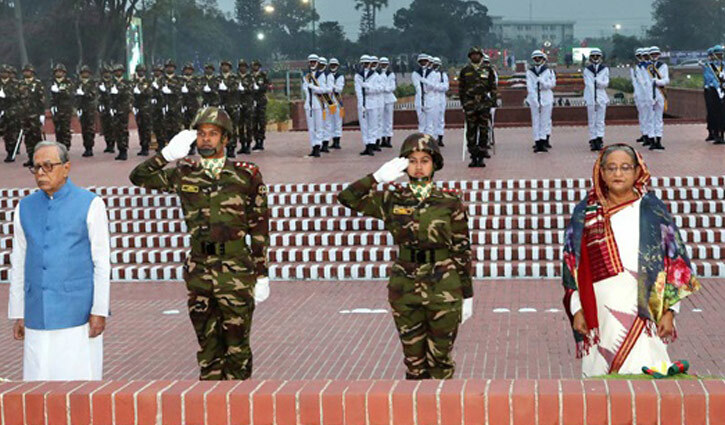 Staff Correspondent, Savar: President Abdul Hamid and Prime Minister Sheikh Hasina paid rich tributes to the martyrs of the War of Liberation by placing wreaths at the National Memorial here this morning marking the 49th Independence and National Day. A smartly turned-out contingent drawn from Bangladesh Army, Navy and Air Force presented a state salute on the occasion while the bugles played the last post. Chief Justice Syed Mahmud Hossain, members of the cabinet, PM’s advisers, parliament members, freedom fighters, foreign diplomats, and high civil and military officials were present. Besides, Speaker Dr Shirin Sharmin Chaudhury, Deputy Speaker Advocate Fazle Rabbi Mia, and Chief Justice Syed Mahmud Hossain also paid homage to the war heroes of 1971 by placing wreaths at the National Memorial at Savar. Wreaths were also placed by Jatiya Party’s Co-Chairperson Begum Rawshan Ershad and Secretary General Mashiur Rahman Ranga. Mayor of Dhaka South City Corporation Sayeed Khokan and Mayor of Dhaka North City Corporation Atiqul Islam also paid homage to the martyrs by placing wreaths separately.